Tired of having to write a letter of complaint or finding it troublesome to ask your local print media to highlight your grouses in their Hotline page? I bet you are. We want everything simplified and done in a super fast and effortless manner these days. Who wouldn't. Especially so when you are dealing with one of the basic necessities in your daily routine - power supply. 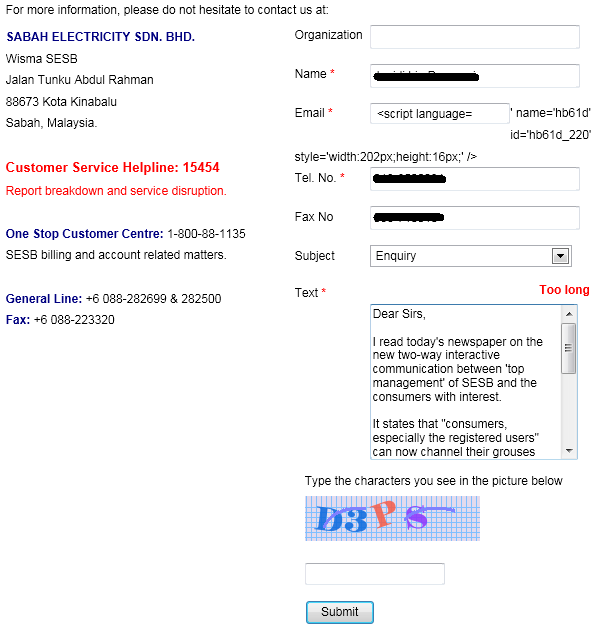 A couple of months ago I bumped into this stumbling block when trying to highlight my 'problem' with the utility company, Sabah Electricity Sdn Bhd (SESB). In its website, the 'Contact Us' link only allow you to send a short SMS-type correspondence or feedback. There are 3 types of feedback - Enquiry, Suggestion, and Complain. I had a lengthy explanation to make and it was in the form of an official letter. The system doesn't allow this. I ended up typing sms-text with the hope they will understand it and to come back to me ASAP. You may ask why I didn't just pick up the phone and call? Let's just say I have my reason for that. Anyway, today's Daily Express carried an article about SESB's new website and it went on to say that starting Tuesday (that would be yesterday, 24th April 2012), consumers especially the registered users can now channel their complaints and grouses through the website that has an email system that will directly go to the MD. The MD, Ir. Abd Razak Salim said, "I will be able to monitor the problems faced by consumers and can follow-up the complaints personally. At the same time, I can also forward and liaise with the concerned divisions in the agency to look into the grouses, effectively". The following is the previous sole method of contacting SESB in writing via electronic. Not really an elaborate way and certainly not interactive. You can see it here. Simple feedback Form, still in use today, if you so prefer. I tried sending enquiry through this method and the system returned some sort of error message. I ended up editing my message short enough in an attempt to fit the system requirement. Still, no luck. Maybe not my lucky day. It keep 'saying' that message is Too Long. Okay, cut the crap! 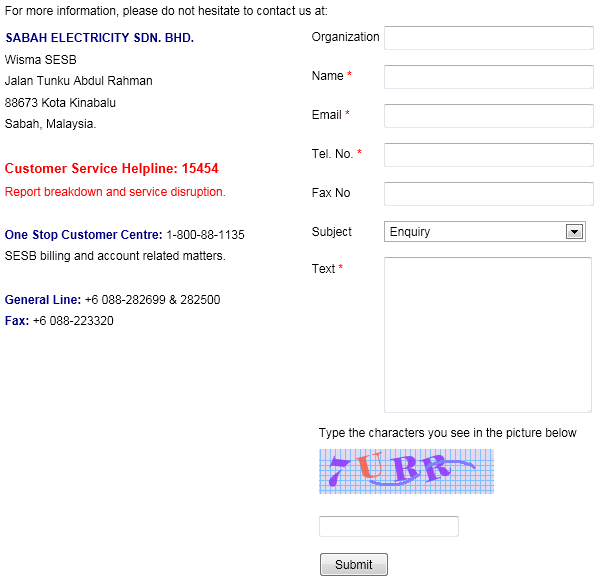 How to contact SESB via e-mail? Forget about the short message way of sending feedback. You can contact them through e-mail: crm@sesb.com.my That's at least what is available in the website after scouring through (with some difficulties). I hope this is the mail address that would go directly to the Managing Director. appreciate your comments and feedback on the website. it was a technical error where the number of characters was limited to certain number. please try again and if you have anymore issues we will assist you. -The comments are forwarded to the MD and top management of SESB through email. I'm glad someone from SESB circle commented on my humble blog. I wrote quite a number of articles concerning SESB on here, both critical and complementary hoping they benefit readers as well as the utility company itself. i had a complain on some leftover waste oil on an abandoned mini hydro in peninsular and i e-mailed TNB through their website and they cleared off the oil in such a quick manner. @thomas. That's a very encouraging response. Good to know.